Quad 405-2 Current Dumping Hi-Fi Separat.. M-Audio BX5 D2 5 2-Way Active 70W Studi.. The Dunlop Systemdek Audiophile Transcri.. Tannoy Revolution DC6T Hi-Fi Floorstandi.. M-Audio Keystation 49es 49-Key USB MIDI.. Fogtec VP 1000 Fogger VP1000 DJ Disco Sm.. Electro-Voice EKX-18S & EKX-18SP Padded.. Ii Very good quality and price. Lk all as described - i would trade again. Jh very happy thank you. Aa Thankyou very much much appreciated:. Id very pleased - thank you. 7h Great item, accurate description, A1 ebayer. 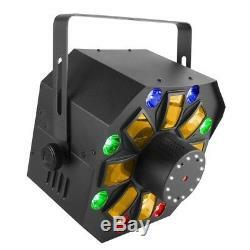 Chauvet Swarm Wash FX 4-in-1 LED DMX DJ Disco Wash / Laser Lighting Effect. It has been tested and is in full working order. The item is in very good cosmetic condition. It comes with the power supply, hanging bracket, remote receiver and the original box. Swarm Wash FX features RGB and ultra violet. Which produces a swarm effect that is made up of 5 colour. (red, green, blue, white and amber). In the centre of the light you have the red and green laser and around the centre ring you also have surface mounted LED strobe lights, so you get a 4-in-1 effect light! Swarm Wash FX is a 4-in-1 LED effect fixture that combines an RGBAW rotating derby, RGB+UV wash, red/green laser, and a ring of white SMD strobes. Create an endless array of looks by individually controlling each effect via DMX and master/slave modes, or an optional IRC-6 remote. Other features include automated and sound activated. And a user-friendly menu structure. Multiple units can be power linked to save time running cables and extension cords. Fits best in the CHS-40 VIP Gear Bag. 4-in-1 LED light that combines an RGBAW rotating derby, RGB+UV wash, red/green laser, and a ring of white SMD strobes. Endless possible looks with individual control of each effect via DMX and Master/Slave modes, or IRC-6. Improved menu structure for ease of use. Red and green laser beams project thousands of beams for maximum coverage. Quick set up with automatic and sound-activated. Control clutter and save time running cables and extension cords by power linking multiple units. Fits best inside the CHS-40 VIP Gear Bag. DMX Channels: 2 or 18. (1 red, 1 green, 1 blue, 1 amber, 1 white) 2 W (650 mA) 50,000 hours life expectancy. RGB+UV 1.5 W (600 mA), 50,000 hours life expectancy. (white) 1 W (300 mA), 50,000 hours life expectancy. Light Source (Laser): 650 nm/100 mW (red) laser diode, 532 nm/30 mW (green) laser diode. Strobe Rate: 0 to 20 Hz. Coverage Angle (SMD Strobe): 71°. Input Voltage: 100 to 240 VAC, 50/60 Hz (auto-ranging). Weight: 9.2 lb (4.2 kg). Size: 335 x 332 x 241 mm. Complies with FDA performance standards for laser products except for deviations pursuant to Laser Notice No. 50, dated June 24, 2007. WhyBuyNew is the trading name of Audio Visual Commodity Ltd. That, as a company, has been established for over 25 years specialising in New, B-Stock, Pre- owned, Ex-Display, Repackaged and Reconditioned DJ equipment, musical instruments and consumer electronics. Now, all these years on, whybuynew is the largest DJ Equipment retailer for New and B-Stock in the UK, built up on giving customers excellent prices and the best customer care possible which was his vision from the very beginning. In February 2017, whybuynew yet again moved to a brand new, larger premises located on The Hythe in Colchester, Essex where we could hold even more stock at bargain prices and have dedicated departments for sales, service and product testing and more. How do I contact you? Gorilla GLS-100 T Bar Lighting Stand Hig.. GPO Bermuda Blue Retro 3-Speed Vinyl Rec.. M-Audio Keystation 61 MKII USB MIDI Velo.. New Citronic CX34 2/3/4-Way Active Cross..
Stagg Les Paul Electric Guitar Hard Carr.. Join Our Exclusive Newsletter For Up To Date News, Special Offers And New Arrivals. Get in touch with us. The item "Chauvet Swarm Wash FX 4-in-1 LED DMX DJ Disco Wash / Laser Lighting Effect" is in sale since Friday, January 4, 2019. This item is in the category "Sound & Vision\Performance & DJ Equipment\Stage Lighting & Effects\Stage Lighting Single Units".